Week 9 on The Great British Bake Off – where has the time gone?? 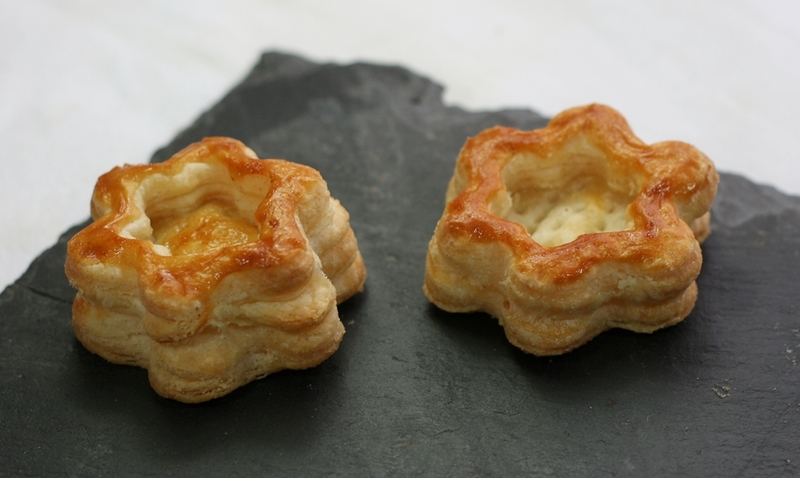 – is Semi-Final week, and the Signature Bake is for three savoury canapes. Now, I could think of about a dozen canapes off the top of my head that have absolutely zero baking element, but that wouldn’t bear much relation to the Bake Off, so my guess is that it will involve pastry – especially since there was a, let’s face it, very similar sweet puff pastry challenge just the other week. We’ve had shortcrust, filo, choux and puff – so the only one(s) left is/are flaky pastry and rough puff pastry, and I’m in two minds which way I’d go. 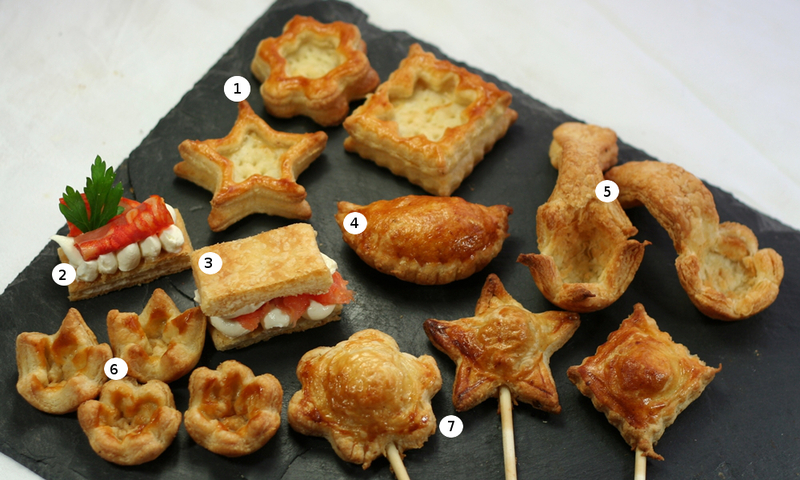 The most impressive might be to make canapes using three different pastries. Then again, showing the diversity and range of what can be achieved using just the one kind of pastry might win brownie points too. If I were to go down the first route, I’d do some kind of mini quiche using my current favourite shortcrust pastry, alongside some gougeres and then something with either rough puff or flaky pastry on account of, as I believe I may have mentioned before, life being too short for puff pastry outside of competition, etc. However, I decided to go down the second route, and show a few of the possibilities using just one type of pastry. Now I learned ‘The Big Four’ (basic pastries – puff, rough puff, flaky, shortcrust) when I was at school. Yes, I am so old I had proper cookery lessons – and still remember the recipes for all: shortcrust = half fat to flour, rough puff & flaky = 3/4 fat to flour, puff = equal fat and flour. Browsing the web I was surprised to see neither of the rough puff or flaky methods that I know ‘out there’, so I abandoned my Bake Off theme (kinda, but not really) and decided to make this post a basic How-To for both flaky pastry and rough puff. Yes, I KNOW that the title of this post just mentions rough puff, but it went so well with ‘stuff’. And no-one loves a rhyming title more than me! But to have included both would have gone very badly – I would have gone with something along the lines of Achy-Breaky Flaky, and from there it’s a short, rapid slide into lip-licking and twerking, and we don’t want that. Nobody wants to see that. If you’re not reading this in late 2013, you might wonder what I’m going on about. Be content with your puzzlement and move on. It’s for the best, believe me. Here’s the lowdown on both rough puff and flaky pastry – quicker than a luxurious all-butter puff pastry, more special than regular shortcrust. As I mentioned above, the proportion of fat to flour is the same for both, but the methods differ. You might prefer one over the other, but as you can see from the photo above, the results do actually differ in a couple of aspects. The flaky pastry has a more even spacing of the layers, and has, for want of a better word, a more controlled rise. The rough puff above seems to have a bigger rise, and also bigger spaces between the layers. However, as will be seen in photos below, when cut into various shapes,they are very similar. 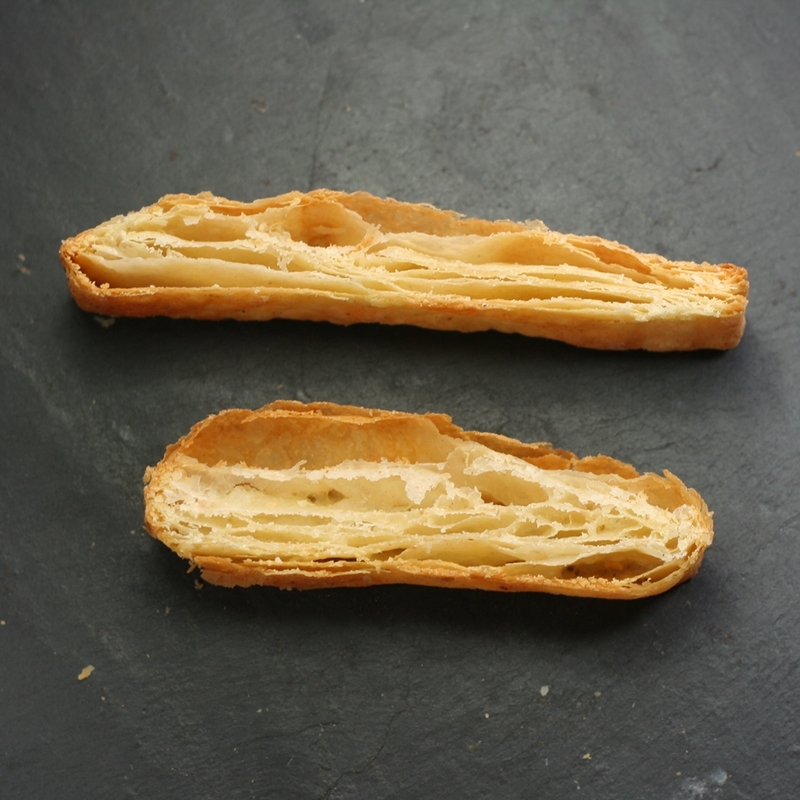 One thing I did notice was that flaky pastry lost it’s structure integrity when cut. That sounds a bit poncy, so I’ll put it another way. When I cut the sheet of flaky pastry into slices, it fell apart. 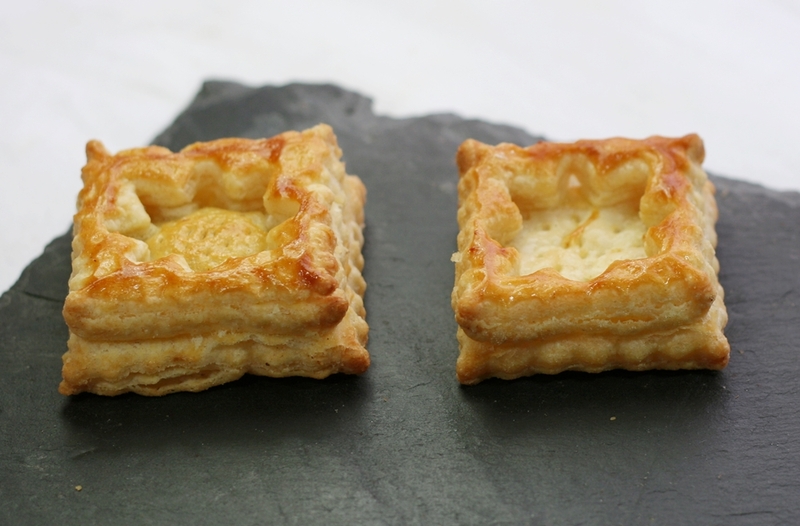 The rough puff held together under the same conditions, and so would be the better choice as a base for an open ‘sandwich’ or for savoury mille feuilles etc. (see photos below). The quantities below made for a range of items, but is probably a bit small to make a batch of one particular thing. Increase the quantities as you see fit. As I have mentioned before, unless you’re catering for vegetarians, the best pastry is made with a mixture of half butter and half lard – butter for flavour, lard for crispness. Make sure the butter and lard are very cold to start. Put the flour into a bowl and add the fats. Stir with a knife to coat the fats with flour. Still stirring, add the water gradually until the mixture comes together. It is supposed to be lumpy. It will even out during the rolling. Fold the bottom third upwards and the top third down, and then turn the whole 90° to the left. Repeat the rolling and folding, then wrap in cling film and chill for 30 minutes. If you have time, chill for another 30 minutes before use. Make sure the fats are at room temperature. Knead the fats together until thoroughly mixed, then shape into a square. Cut the square into quarters. Put the flour and one of the quarters of fat into a food processor and blitz until well mixed. Add the iced water gradually, until the mixture comes together into a ball. Scatter more flour over the top and roll out into a long, thin rectangle – ideally three times as long as it is wide, but don’t fret too much. Take one of the quarters of fat and either dab little pieces or, if it is soft enough, spread it over the top two thirds of the pastry. Wrap in cling film and chill for at least 30 minutes, but preferably for an hour, due to the softness of the fats. Roll, dab, fold and turn two more times (for a total of three) and you’re done. I like to do one final roll/fold, without any additional fat, just for luck. Chill thoroughly for 1-2 hours, preferably overnight. Both pastries need a HOT oven to cook – 220°C, 200°C Fan – and unless you’re baking large items, probably no more than 10 minutes. Turn the baking tray around 180° after 5 minutes to help ensure even colouring. Brush with beaten egg for a shiny, glossy finish. Do NOT let the egg wash run down the sides or over any cut edges, as it will act like a glue to the layers of pastry and they won’t rise evenly. Pricking the bottom of a tart/vol au vent will help keep it from rising up too much. 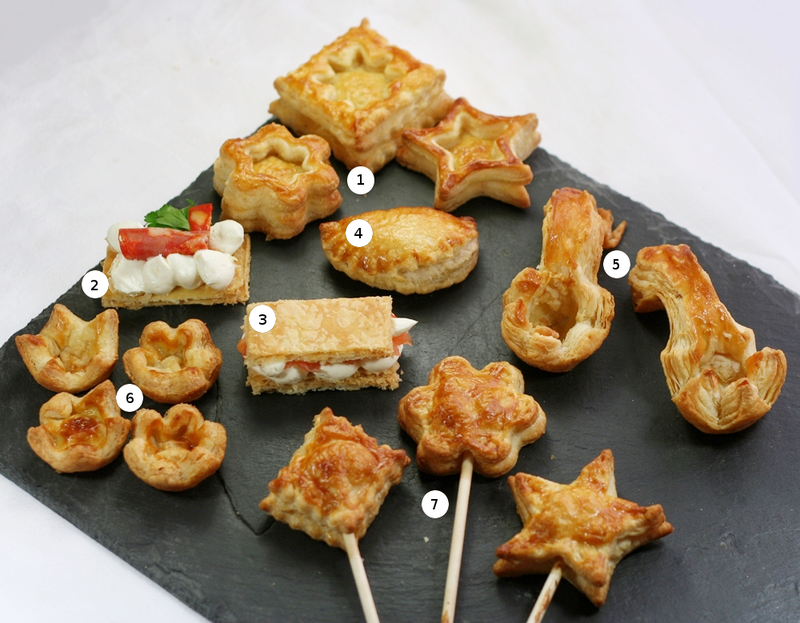 This post is already way too long to go into much detail, but the pictures below show how each of the pastries performs with a variety of canape shapes. Each was glazed with beaten egg (except the rough puff spoons, I forgot, mea culpa), then baked for a total of 10 minutes in a 200°C Fan oven, turning the baking sheet around halfway through the cooking time. I’ve left them mostly unfilled, to display to better effect, how well each type of pastry performs with each of the various shapes. 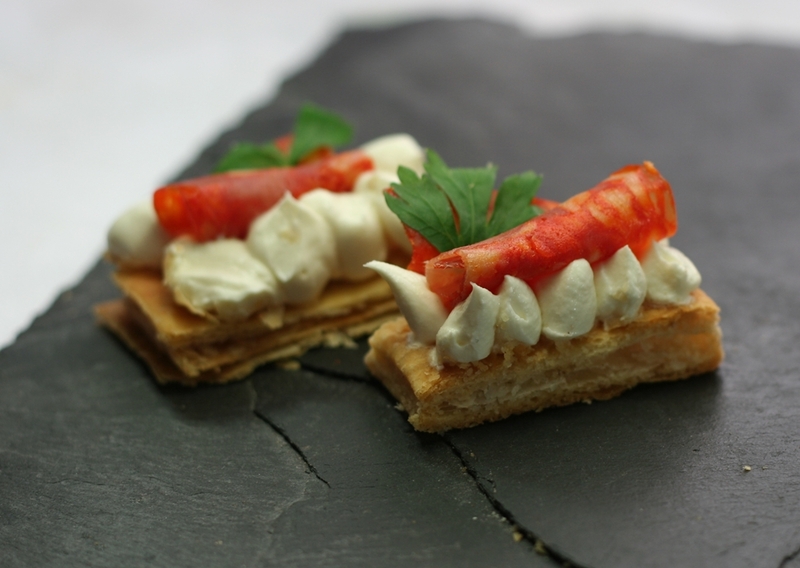 Canapes are meant to be eaten in one bite, possibly two, just as long as it can be done without mess. Aim for big flavours, since there’s only room for a small amount of filling. Try and include some ‘fresh’ element – grapes, celery, cucumber – to contrast with the rich, crispy pastry. Pesto packs a serious punch, even in small amounts. Pipe fillings into vol au vent cases for an even finish. Avoid overly wet fillings for pies and turnovers. Vol au Vent cases Cut two shapes the same size, then cut the centre out of one and stack it on top of the intact piece to make the walls of the vol au vent. Don’t just stick with traditional round/oval shapes, experiment with other shapes and sizes. 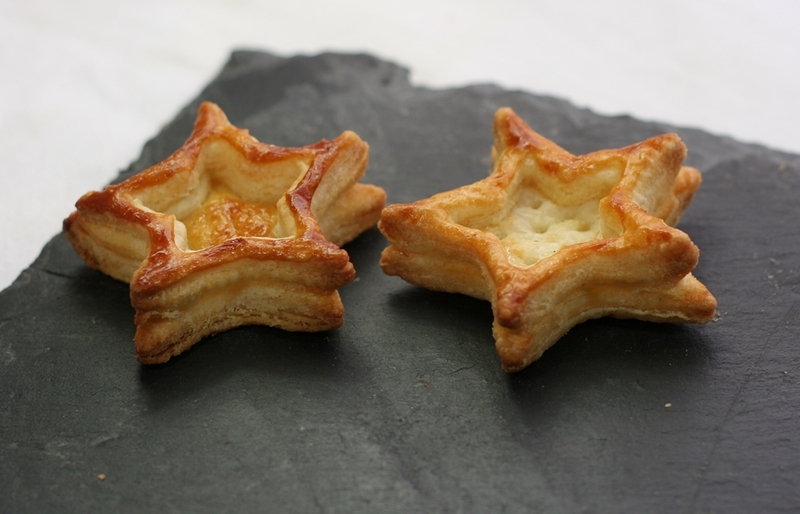 You can liven up even a plain shape by using a star or flower shaped cutter for the hole in the middle. Brush the bottom pastry with water to make sure the top adheres, but don’t press down too firmly – you still want the sides to rise up. Don’t forget to prick the bottom and glaze the top surface with egg wash.
Open-face sandwich – here topped with cream cheese, chorizo and some parsley. 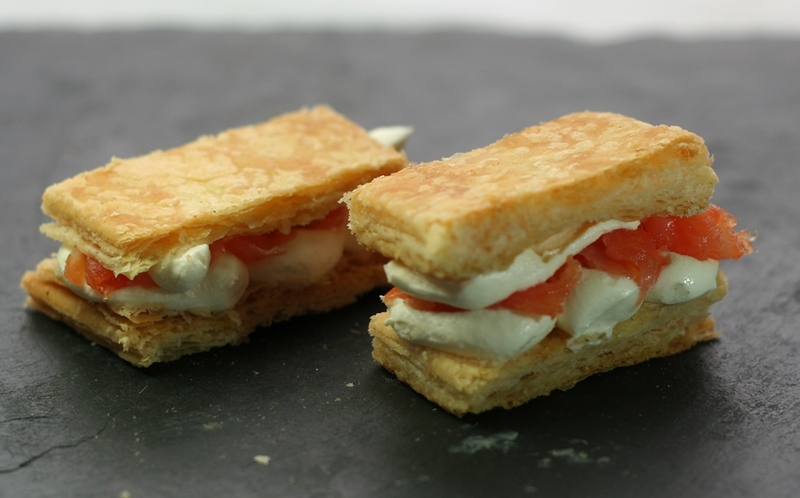 Savoury Mille Feuille – Here with, for example only, cream cheese and smoked salmon. For this and the previous canape, you can ensure an even, flat surface to your pastry and control the rise by laying a weight of some sort – a loose-bottom from a cake or tart tin is ideal – on top as it goes into the oven. You might be surprised at how much lift the pastry can still achieve even when weighed down in this manner. Mini turnover/empanada/piroshki. I’ve used a folding, plastic form to get the lovely, even shape. Pastry spoons -eliminate the need for both cutlery and washing up with these free-standing pastry spoons. Cut a template using a mini cutter for the spoon and a free-drawn spoon handle. Press the bowl of the spoon into a mini-muffin case and drape the handle over the side of the tin and into the next door hole. Press a finger into the bowl of pastry and against the sides to reduce it to tissue paper thinness, otherwise the whole thing will puff up and lose any shape. Miniature tarts – these really are bite size – similar to the ‘spoons’ but without the handle, baked in a mini muffin tin. The filling should really pack a punch, flavour-wise, as they are so tiny. Mini pies onna stick! Take care pressing the pastry around the filling – try not to squash the edges together. This is fab Mary-Anne, can’t wait to try these, they will be brilliant for Christmas! Excellent roundup of these pastries. Congratulations. Thank you – I shall be trying the rough puff this week-end because all though my hands are cold naturally I can do short crust but not much else! Wow! Can’t wait to try these on the weekend!